Not to be confused with Taipei, the capital city of Taiwan. New Taipei City (Mandarin Pīnyīn: Xīnběi Shì; Hokkien POJ: Sin-pak-chhī) is a special municipality and the most populous city in Taiwan. Located in northern Taiwan, the city includes a substantial stretch of the island's northern coastline and surrounds the Taipei Basin, making it the second largest special municipality by area, behind Kaohsiung. 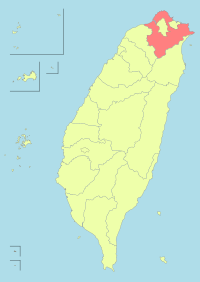 New Taipei City is bordered by Keelung to the northeast, Yilan County to the southeast, and Taoyuan to the southwest. It completely surrounds Taipei. Banqiao District is its municipal seat and biggest commercial area. Until 2010, the area that roughly corresponds to the present New Taipei City was known as Taipei County. New Taipei City was known as Taipei County before its promotion to city status in 2010. After the county's population overtook that of Taipei City, it was decided that the county should be promoted to city status but could not be renamed "Taipei City". The name of the new entity (新北市; 'New North City') was at first rendered in English as Xinbei City via pinyin romanization, but both candidates for the city's first mayoral election opposed the name. Consequently, citing public opinion, the inaugural mayor, Eric Chu, requested and received approval from the Ministry of the Interior (MOI) to render the name in English as New Taipei City. This rendering became official on 31 December 2010. Archaeological records show that New Taipei City had been inhabited since the Neolithic period, with artifacts dug in Bali District having shown remains as early as 7000 to 4700 BC. The region around New Taipei City area was once inhabited by Ketagalan plains aborigines, and evidence shows that the Atayal had inhabited Wulai District. The earliest recorded migration by people from mainland China dated back as early as 1620, when the local tribes were driven into the mountain areas. Over the years, many of the aborigines have assimilated into the general population. During the Qing Dynasty rule of Taiwan, the Han Chinese people began to settle in the area now designated as New Taipei City in 1694 and the number of immigrants from mainland China had further increased. After decades of development and prosperity, Tamsui had become an international commercial port by 1850. British consulate and stores were established in the region, which helped promote the local tea business, resulting in massive tea leaf exports to Europe. In 1875, Shen Baozhen called for the establishment of Taipeh Prefecture. Fujian-Taiwan-Province was declared in 1887 and the present-day New Taipei City area fell under the jurisdiction of Taipeh Prefecture. In 1895, Taiwan was ceded by the Qing dynasty to the Empire of Japan. During Japanese rule, the New Taipei City area was administered under Taihoku Prefecture together with modern-day Taipei, Keelung and Yilan County. Gold and other mineral deposits were discovered at Keelung Mountain, triggering a mining boom in the region. In October 1896, the Japanese government divided the mining area around Keelung Mountain into two districts: an eastern district, designated as Kinkaseki, and a western district, designated as Kyūfun. Both districts are now parts of Ruifang District. They also issued regulations barring local Taiwanese mining companies from mining in the area, giving the mining rights to Japanese companies instead. After the handover of Taiwan from Japan to the Republic of China in October 1945, from 25 December of the same year, the present New Taipei City area was administered as Taipei County with Banqiao City as the county seat. In July 1949, the size of Taipei County was reduced when Beitou and Shilin townships were put under the jurisdiction of the newly created Caoshan Administrative Bureau, which would later be renamed the Yangmingshan Administrative Bureau. On July 1, 1968, the size of Taipei County was further reduced by 205.16 km2 (79.21 sq mi) when Jingmei, Muzha, Nangang, and Neihu townships, along with Beitou and Shilin, were merged into Taipei City. The county afterward had ten county-controlled cities (Banqiao, Luzhou, Sanchong, Shulin, Tucheng, Xizhi, Xindian, Yonghe, Zhonghe); four urban townships (Tamsui, Ruifang, Sanxia, Yingge); and fifteen rural townships (Bali, Gongliao, Jinshan, Linkou, Pinglin, Pingxi, Sanzhi, Shenkeng, Shiding, Shimen, Shuangxi, Taishan, Wanli, Wugu, Wulai). It was further divided into 1,017 villages and 21,683 neighborhoods. In August 1992, due to the adjustment of the demarcation line between Taipei City and Taipei County around Neigou and Daking Creeks, the area of Taipei County was decreased by 0.03 km2 (0.012 sq mi). On 25 December 2010, Taipei County was upgraded to a special municipality as New Taipei City consisting of 29 districts with Banqiao District as the municipal seat. New Taipei City is located at the northern tip of Taiwan Island. It covers a vast territory with a varied topology, including mountains, hills, plains and basins. In the northern part lies 120 km (75 mi)of coastline with gorgeous shorelines and beaches. The Tamsui River is the main river flowing through New Taipei City. Other large tributaries are the Xindian, Keelung and Dahan rivers, sections of which constitute riverside parks. The tallest peak in the city is Mount Zhuzi [zh], standing at 1,094 m and located in the Sanzhi District. The climate of the city is characterized as a humid subtropical climate with seasonal monsoons with ample rainfall evenly distributed throughout the year. Seasonal variations of temperatures are noticeable although temperatures typically varies from warm to hot throughout the year, except when cold fronts strikes during the winter months when temperatures can sometimes dip below 10 °C (50 °F). January is typically the coolest month and July is usually the warmest. New Taipei City is a special municipality directly under the central government of the Republic of China. The New Taipei City Government is headed by an elected mayor and is headquartered at the New Taipei City Hall at Banqiao District. The current mayor of New Taipei City is Hou You-yi of the Kuomintang. 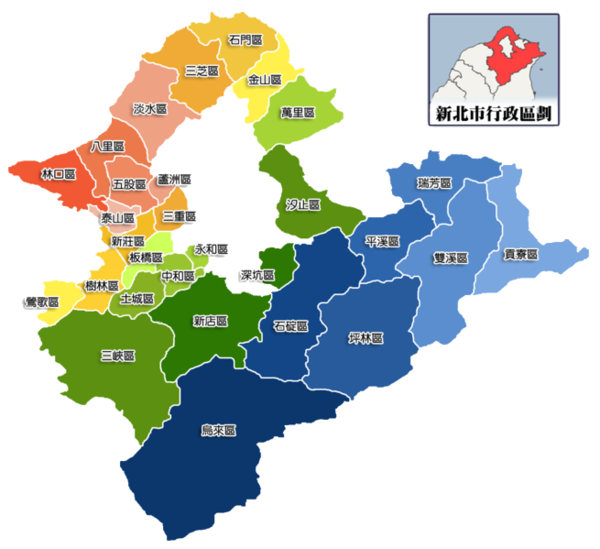 New Taipei City controls 28 districts (區; qū) and 1 mountain indigenous district (山地原住民區; shāndì yuánzhùmín qū). The sub-city entities consists of 1,017 villages (里; lǐ), which in turn are divided into 21,683 neighborhoods (鄰; lín). The municipal seat is located at Banqiao District. Colors indicates the common languages status of Formosan languages within each division. Many agencies of the central government are located in New Taipei City due to its proximity to the capital Taipei City. The Council of Indigenous Peoples, Hakka Affairs Council and Ministry of Culture are headquartered in Xinzhuang District at the Xinzhuang Joint Office Tower. The Architecture and Building Research Institute, Aviation Safety Council and National Airborne Service Corps, National Fire Agency of the Ministry of the Interior and the National Science and Technology Center for Disaster Reduction of the Ministry of Science and Technology are located in Xindian District. Financial Supervisory Commission is located at Banqiao District. The Atomic Energy Council is located at Yonghe District. The National Academy for Educational Research of the Ministry of Education is located at Sanxia District. New Taipei City has an estimated population of around 3.9 million. Over 80% of New Taipei City's residents live in the 10 districts that were formerly county-controlled cities (Banqiao, Luzhou, Sanchong, Shulin, Tucheng, Xizhi, Xindian, Xinzhuang, Yonghe and Zhonghe), which account for one-sixth of the area. 28.80% of the residents moved into the area from Taipei City. [clarification needed] Around 70% of the population living in New Taipei City come from different parts of Taiwan, and there are around 73,000 foreigners residing in the city, making New Taipei City the third largest municipality in Taiwan in terms of foreign resident population. The city is home to 952 registered temples and 120 churches, including 160 Buddhist-Taoist temples and more than 3,000 Taoist shrines. The city also houses five major Buddhist monasteries, such as the Dharma Drum Mountain in Jinshan District and Ling-jiou Mountain Monastery in Gongliao District. On average, there are two worship places in every square kilometer around the city. Xizhi District and Sanxia District have the highest number of registered temples, while Wulai District has the fewest. New Taipei City houses the Museum of World Religions in Yonghe District. New Taipei City is home to the Banqiao Stadium and Xinzhuang Baseball Stadium. Due to its strategic location, New Taipei City is the second major city of business industries after Taipei, with over 250,000 privately owned companies and 20,000 factories scattered around five industrial parks with a total capital of NT$1.8 trillion. There are also many high technology industry, service industry and tourism industry, contributing a significant amount of GDP to Taiwan. The five major industries in the city are information technology (IT), telecommunications, digital contents, biotechnology and precision instruments. The city is among the top three cities in the global market in terms of IT product production volume, securing more than 50% of the global market share for products such as motherboards, notebooks, LCD monitors and CRT monitors. New Taipei City is also filled with many cultural and creative industries, such as pottery in Yingge District, Liuli industry in Tamsui District, drum industry in Xinzhuang District, dye industry in Sanxia District, noble metal processing industry in Ruifang District, sky lantern industry in Pingxi District, etc. The Taiwan Film Culture Center is planned to be built in Xinzhuang District for the key resource of the development of film industries in Taiwan. The Knowledge Industry Park is also planned to be built in the same district to encourage the clustering and expansion of digital content companies and will help turn the city into a virtual digital entertainment park. The Port of Taipei located in Bali District has the capability of fitting container ships weighing up to 80,000 tons and transporting more than 2 millions of TEU annually. The Tamsui Fisherman's Wharf in Tamsui District serves as the main port for fishing boats, as well as for sightseeing and leisure. Education in New Taipei City is governed by the Education Department of New Taipei City Government. The city population is highly educated, with over 38% of the people received higher education. 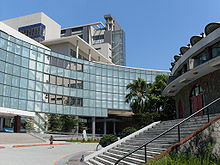 The city houses many government and private universities, such as Aletheia University, Chihlee University of Technology, Fu Jen Catholic University, Hsing Wu University, Huafan University, Jinwen University of Science and Technology, Ming Chi University of Technology, National Open University, National Taipei University, National Taiwan University of Arts, St. John's University, Tamkang University etc. Some of the colleges in the city are De Lin Institute of Technology, Lee-Ming Institute of Technology, Mackay Medical College, Oriental Institute of Technology etc. Founded in 1914, the National Taiwan Library, the oldest public library in Taiwan, is located in the city at Zhonghe District. Opened in January 2008, the Sustainable Development Education Center in Bali District is a center for wetland conservation education. New Taipei City houses two of Taiwan's current active nuclear power plants, which are the Kuosheng Nuclear Power Plant in Wanli District and Jinshan Nuclear Power Plant in Shimen District, Taiwan's first nuclear power plant. The planned fourth nuclear power plant, Lungmen Nuclear Power Plant, located at Gongliao District has currently been halted due to public opposition. Other power generations in the city are the Linkou Coal-Fired Power Plant in Linkou District and Feitsui Hydroelectric Power Plant in Shiding District. New Taipei City has been developed towards a Green Future City. The city provides Carbon Reduction Clinic for houses and businesses with general consultation and on-site inspections for greener equipment, in which it is helped by the low-carbon community subsidies. The city also implements the Assist Industries with Cleaner Production Plan to help businesses adapt to the efforts toward becoming green industries. The city government also actively promoting green energy industries and smart electric vehicles. In January 2016, New Taipei City was the top in terms of electricity saving in Taiwan, in which electricity consumption for the period April–November 2015 was cut down by 1.24%. Zushi Temple in Sanxia District. Taiwan Coal Mine Museum in Pingxi District. Hohaiyan Rock Festival in Gongliao District. New Taipei City has a wide range of historical, natural and cultural attractions for tourists. 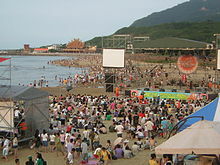 Tourism-related industries in the city are governed by the Tourism and Travel Department of New Taipei City Government. Historical attractions include Bitoujiao Lighthouse, Chin Pao San, Fort Santo Domingo, Hobe Fort, Ōgon Shrine, Tamsui Old Street, Lin Family Mansion and Garden, Fugueijiao Lighthouse, Cape San Diego Lighthouse and Qing dynasty remnants in Tamsui and the old mining towns of Jiufen, Jinguashi and Jingtong in the east. Sanxia houses the historic Minquan Street. The most famous temple is the Zushi Temple in Sanxia District. Jinshan District houses the Dharma Drum Mountain. There are numerous notable museums and galleries, such as Drop of Water Memorial Hall, Gold Museum, Jing-Mei Human Rights Memorial and Cultural Park, Jingtong Mining Industry Museum, Ju Ming Museum, Li Mei-shu Memorial Gallery, Li Tien-lu Hand Puppet Historical Museum, Museum of World Religions, New Taipei City Hakka Museum, New Taipei City Yingge Ceramics Museum, Pinglin Tea Museum, Sanxia History Museum, Shisanhang Museum of Archaeology, Taiwan Coal Mine Museum, Taiwan Nougat Creativity Museum, Tamkang University Maritime Museum, Tamsui Art Gallery, Teng Feng Fish Ball Museum, Wulai Atayal Museum, Wulai Forestry Life Museum and Xinzhuang Culture and Arts Center. Natural attractions include the Wulai and Shifen waterfalls, Bitan, Wulai hot springs, Stone Sculpture Park, Cape San Diego, Twin Candlestick Islets, Xinhai Constructed Wetland, hoodoo geological formations at the Yehliu seacoast, and hiking in Mount Guanyin, Wulai, Pingxi and the northeast coast. Tamsui Fisherman's Wharf along the Tamsui River is a popular place for leisure and sightseeing. Popular beaches include Fulong, Yanliao and Baisha Bay. Theme parks and resorts in the city include Formosa Fun Coast, Yehliu Ocean World, Yun Hsien Resort etc. Famous night markets in the city are Nanya Night Market and Lehua Night Market. New Taipei City regularly hosts around 5,000 annual art, music and cultural festivals, such as the Hohaiyan Rock Festival in Gongliao District. The Lantern Festival is held regularly in the city particularly in Pingxi District, where sky lanterns are made throughout the year for people to buy. Guests can also learn how to make their own lanterns, paint their hopes, dreams and wishes on them, then release them to the sky in the hopes that their prayers will be answered. Other festivals include the Yeliu Religious Festival, Cherry Blossom Season, Ching Shui Tsu Shih Rituals, Mazu Cultural Festival, Zhonghe Water Festival, Green Bamboo Shoot Festival, Tung Blossom Festival, Fulong Sand Sculpture Festival, Shimen International Kite Festival, Taishan Lion Dance Culture Festival, Color Play Asia etc. The area is served by Taiwan High Speed Rail through the Banqiao Station, which is an intermodal station with Taiwan Railway Administration (TRA) and Taipei Metro. The TRA's Yilan Line runs through Gongliao, Shuangxi and Ruifang. The Western Line runs through Xizhi, Banqiao, Shulin and Yingge. The Pingxi Line connects Pingxi to Ruifang. Wulai District houses the Wulai Scenic Train. The Taipei Metro serves the area through the Tamsui Line in Tamsui, the Zhonghe Line in Yonghe and Zhonghe, the Luzhou Line in Sanchong and Luzhou, the Xinzhuang Line in Xinzhuang, Sanchong, and Taishan, the Xindian Line in Xindian, and the Bannan Line from Banqiao on out. The Taiwan Taoyuan International Airport Access MRT System operated by Taoyuan Metro links Sanchong, Xinzhuang, Taishan and Linkou. A famous bridge in New Taipei City is the Taipei Bridge, connecting New Taipei City with Taipei over the Tamsui River. Another famous bridge is the New Taipei Bridge. The area's air traffic is served by Taiwan Taoyuan International Airport in neighboring Taoyuan City and Songshan Airport in Taipei. ^ "Demographia World Urban Areas PDF (April 2016)" (PDF). Demographia. Retrieved 13 June 2016. ^ "Demographia World Urban Areas PDF (April 2016)" (PDF). Demographia. Retrieved 6 June 2016. ^ 標準地名譯寫準則. 全國法規資料庫. 9 November 2009. Retrieved 23 December 2010. ^ 中文譯音使用原則 (PDF). 中華民國教育部. 18 December 2008. Retrieved 23 December 2010. ^ 新北市譯名 朱立倫依多數民意. 中央社. 20 December 2010. Archived from the original on 3 March 2012. Retrieved 23 December 2010. ^ 尊重新北市政府的意見，新北市譯寫為「New Taipei City」 (Press release). 中華民國內政部. 31 December 2010. ^ a b "Cincinnati Sister Cities". Cincinnati Sister Cities. Archived from the original on 5 July 2015. Retrieved 4 July 2015. ^ a b "New Taipei City Government - History". Archived from the original on 5 July 2015. Retrieved 4 July 2015. ^ a b "New Taipei City - A Metropolis Redefined". YouTube. 17 August 2012. ^ "Historical background". taiwan.gov.tw. Archived from the original on 27 May 2014. ^ "Great Taipei Travel: Great Taipei Tours, Maps, Hotels, Attractions & Travel News(旅遊王TravelKing)". Retrieved 4 July 2015. ^ "New Taipei City Government - Introduction". Foreigner.ntpc.gov.tw. Archived from the original on 24 October 2013. Retrieved 15 May 2014. ^ 臺灣地區鄉鎮市區級以上行政區域名稱中英對照表 (PDF). Online Translation System of Geographic Name, Ministry of Interior. 16 June 2011. pp. 1–2. Archived from the original (PDF) on 25 March 2012. ^ "Contact ASC Archived 15 February 2011 at the Wayback Machine." Aviation Safety Council. Retrieved on 10 June 2009. "Address: 11th Floor, 200, Section 3, Beixin Road, Xindian District, New Taipei City 231, Taiwan (R.O.C.)" ^ a b "New Taipei City Government - Introduction". ntpc.gov.tw. Archived from the original on 19 August 2014. Retrieved 15 August 2014. ^ "New Taipei City Government - Population". ntpc.gov.tw. Archived from the original on 21 December 2014. Retrieved 15 August 2014. ^ "New Taipei City focusing on religion". taipeitimes.com. ^ a b "New Taipei City Government - Culture ＆ Creativity". Archived from the original on 5 July 2015. Retrieved 4 July 2015. ^ "New Taipei City Government - Going Green". Archived from the original on 5 July 2015. Retrieved 4 July 2015. ^ (Taiwan), Ministry of Foreign Affairs, Republic of China (13 January 2016). "New Taipei crowned national energy-saving champion - Taiwan Today". Taiwan Today. ^ "New Taipei City Government - Popular Attractions". ntpc.gov.tw. Archived from the original on 3 May 2015. Retrieved 15 August 2014. ^ "NTPC Travel - Pingxi Sky Lanterns Festival". ntpc.gov.tw.